Are you following your husband? I was jogging this morning, happily heading up the other side of our block, when I saw the handsomest man I have ever seen! He was coming down the street, headed right for me, and he was also out for his morning exercise. So I did the only thing any sane woman would do. I turned around and joined him. Given the fact that I am over forty, I don't often turn around to join other people in their morning exercise. I have my little routine, and I stick to it. We oldies but goodies are afraid of change. But for this particular guy, I would do anything. Because he's my husband. Now, normally my husband jogs with my daughter. He's a man and she's a teenager, so they are way beyond me, fitness-wise. They jog three times a week and go around the block three or four times. I do it twice on a good day (though I am slowly doing more and have high hopes that by the end of the year I might be able to keep up with them). They also purely do that thing called jogging. I, on the other hand, do that erratic speed walk/jog thing that women over forty often do for exercise. I also go the opposite way around the block for reasons that nobody would be able to understand, so I won't disclose. When I saw my husband, I left my exercise routine and followed him. I've been doing that for years, come to think of it, starting from the day I walked down the aisle and said "I do." My husband says that saying "I do" is basically saying "I die," because it means you are making a commitment to die to self for the other person. This morning I did this by dying to my exercise and living for his. And then I died some more, because his legs are about three feet longer than mine, which means I have to take two steps for every one of his. Not fair! I was also dying for breath and my muscles were whimpering and my heart was pumping so fast I thought it would explode. And I also nearly died with surprise when I actually jogged the whole way around the block with only a very small pause to speed walk once or twice. I didn't think I could do that. But it made me think about marriage in general. How this is exactly what I, as a wife, have had to do on a meta scale. When he asked me to marry him, I turned around and followed him. When he was called to teach at a Bible college in Wisconsin, I turned around and followed him. When God told him to go to Cambodia for a summer, I turned around and followed him. When God told him to go to South Africa the next summer, I turned around and followed him. When God told him to leave Wisconsin and go to the Philippines, I turned around and followed him. But sometimes the small-scale about-faces are harder to make than the large ones. Maybe it was easy for you to turn around and follow your husband when he knelt and offered you a dozen roses and a diamond ring. But maybe it's far harder when he asks you to. . .
Take on a new ministry. Move to a new job. ​And there are even smaller, sometimes harder, ways to stop, turn around, and follow our husbands by dying to self. We can stop pouring our coffee in order to pour our husband his. Stop talking to a friend on the phone in order to talk to him. Stop sweeping the kitchen floor in order to iron his shirt. Stop putting away laundry in order to offer him a glass of water. Stop whatever we are doing when he gets home from work in order to meet and greet him with a kiss. So I ask you: in what way can you turn around and follow your husband today? How are you doing with your goals for this year? Have you done a mid-year review? Did it leave you energized and excited over all the goals you met? Or do you find you are behind? 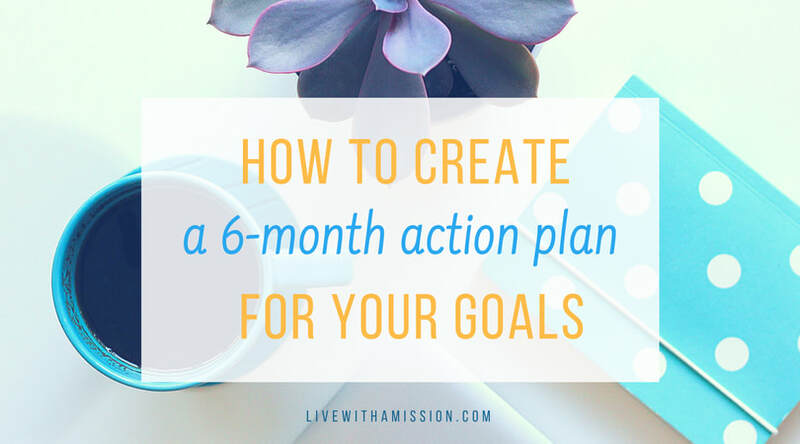 Here is one way to create a strategic 6-month action plan that will help you meet your goals for this year. . . no matter how far behind you might be. ​​I love new beginnings. I adore the first day in January. While many people are sleeping off the effects of New Years' Eve parties, I'm generally up early with my notebook and Bible. Because I love the idea of a new year, new goals, new accomplishments, I don't want to waste a single moment of my bright new start. Maybe this is why I also love mornings. Each glorious sunrise brings the promise of a new day, a new chance. When my husband played golf (for the first and only time) a few years ago, he brought home a new word. Mulligan. A Mulligan in golf terminology is a do-over. A second chance. I think that's how I feel about fresh starts, so I try to notice and celebrate them. Today is the fifth of July. But before the month of July had begun, I had already prepared for it. July is a great time to issue yourself a fresh start! The first of July ushers in the first day of the second 6 months of your year. About time, in my mind, for a Mulligan. This year I definitely needed a Mulligan. 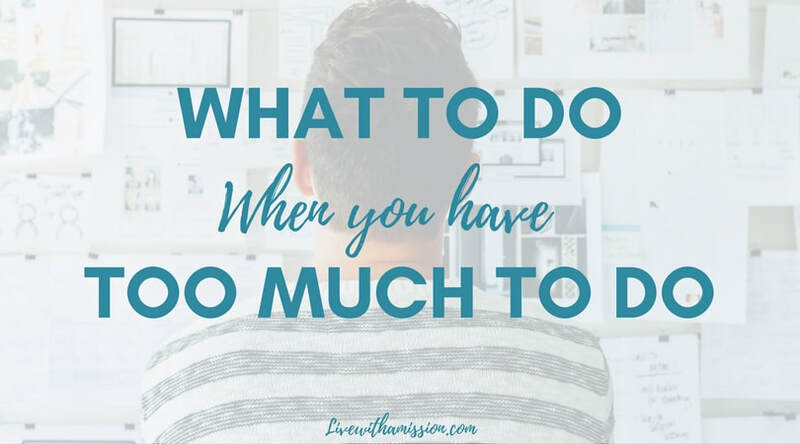 My husband and I laid out our goals for the year--as usual--in January, but even at that time, I already could foresee that the first six months of my year would be a matter of simply clinging to the edge of my obligations with my fingernails. There would be a lot of barely getting by and not much in the realm of actual progress. Not that I'm complaining! For a mom like me, most of life lies in the sacred mundane: laundry, homeschooling, church activities, supporting and helping my husband, sweeping, washing dishes, cooking, nurturing my children. I'm one of those blessed women who always wanted to do exactly what I am doing, and all those things are a part of that life. I'm grateful for this. I love these things. But there are a few things I feel a need to add to that mix. These are some of the things that ended up on my goals list for the next 6 months. Reading. I have always been an insatiable reader, but the last few years have made that challenging for me. I want to read more, and not just any books, but good books. Ones that help me to grow. Also, I wanted to read through the Bible twice this year. That takes time and mental hard drive space. Exercise. Vitamins. Water. Healthy food. Reading to my children and playing board games with them. Specific ministries and preparation for them. These, and many other things, are on my goals list. Which, as I was saying, I updated as of July 1. My husband and I read back over our goals, discussing which ones we completed, which ones we no longer felt a burden for, and which ones we needed to start focusing on again. 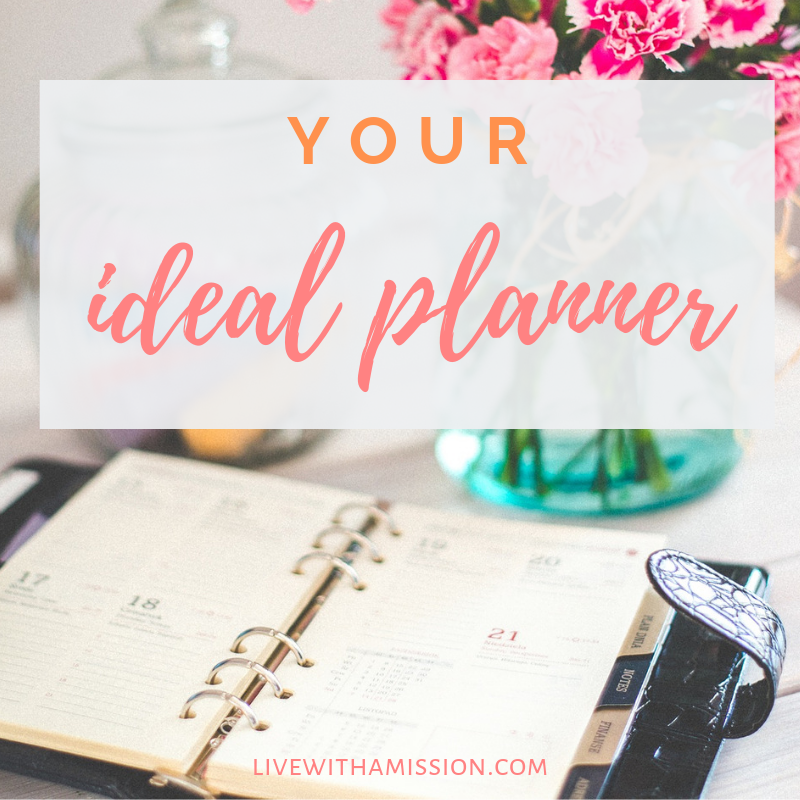 And then I made a more complete goals list for myself in which I delineated my biggest priorities and the focus areas of each one, along with my "next step" in that area and a list of small steps to take to complete the project or move forward with my priority. It's a simple process, breaking down your priorities into smaller, manageable goals. But many people don't do it. They see a goal, like "Clean out the garage," and they envision a huge project that requires three weeks to accomplish. So they never move forward on it. But that's not the way to accomplish a goal or a project. The way to accomplish a project is to chunk it down into manageable sections and then break it down further until you have tiny, concrete, 5-10 minute mini-projects. Then you can move forward, absolutely clear on what the next step is and when you should finish it. For instance, as I said, one of my priorities is reading. I want to read through the Bible twice this year, taking notes and making it a meaningful journey. That's a big task, and not one that can be accomplished all at once in a block of time. Instead, I have to chunk it down into several small steps. First, have a reading plan. Be a part of an accountability group where we are all working toward a similar goal. Make time in my daily morning routine for the larger amount of time I need to read. Pick the actual Bible I will use. Print my Spiritual Fitness Journal pages. Have a writing journal to go with it. Put "clean off my desk" on my evening routine (have you ever seen a homeschool mom's desk at the end of the day?) so that I can spread out my Bible and various notebooks. And finally, pick my start and end date and plan for catch-up days for those times when I don't complete all the chapters for a certain day. Actually, that was the easy part of my reading goal. The Bible reading. The hard part is the "two books a month" that I want to read in addition to the Bible. Which books? How do I get them? When do I read them? It's easy to fall into analysis paralysis and never actually take the first step toward your goal. How many times have we all done that? Then I challenged myself to finish each book in two weeks. So at the beginning of each two week block, I have to look at the Table of Contents to see how many chapters there are, so that I know approximately how many I need to read each day to finish within that time. ​Then I put a time slot into my day when I would devote myself to reading that book. Because there is always work to be done (floors to be swept, laundry to be folded, tests to be graded), if I don't compartmentalize my day somewhat, homeschooling and housework will eat my whole entire schedule. Swallow it whole. Gobble it down, and leave no leftovers for me or anything else. So a major task in accomplishing our goals as women with a mission is to compartmentalize our time. I do this by making myself a time budget, telling myself that from this time to that time I don't do housework or homeschooling (unless my ox is in the ditch). From this time to that time, I only focus on these other important tasks. This time-compartmentalization is an extremely important part of my goal setting process. However, I have found that accomplishing my goals, even after chunking them down and picking the next step and compartmentalizing my time, is still a challenge to follow through with. It seems like the urgent things of life always crowd out the important things of life. So I sometimes need accountability. 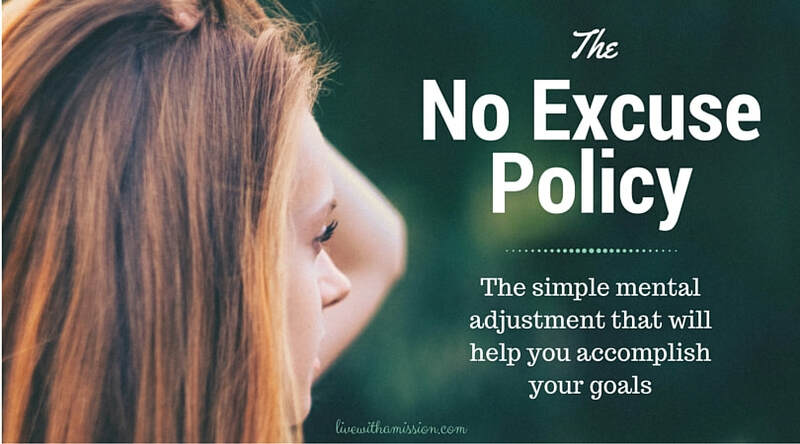 ​The problem is that accountability opportunities don't usually just magically appear. Sometimes you have to create them. I look for ways to create accountability in several places. I hold myself accountable on paper. Somehow, the act of acknowledging on paper that I did (or didn't do) the thing I am committed to doing makes it more tangible and more grave an offense if I fail. I can look back and measure myself this way. I can self-edit: "Oops. . . I forgot my vitamins three times this week. What do I need to do to make sure I remember?" We share our goals with each other. We don't crack any whips over each other's heads, but we challenge each other and encourage each other. When we know the going is tough, we try to help the other person accomplish their goals: "I'll watch the kids this morning, honey, so you can finish that project." Not only are we spouses and best friends, we are awesome accountability partners. If you are really struggling with something and need to take it to the next level, you may want to find someone who can help you on a more formal basis. This is the idea behind a personal fitness trainer or a counselor. Coaches are experts in the field you want to improve in. Finding a coach could mean taking a class, signing up for a seminar, or registering for a conference. It might mean hiring someone to help you, but it doesn't have to. Maybe it means finding a mentor who is willing to take some extra time with you. How are you doing with your goals for this year? Do you need to take some time to re-evaluate where you are and how you are doing? Use the free 6-Month Action Plan Workbook to set and accomplish goals this year. ​We all know we should quit our bad habits right now. This very second. Or maybe yesterday. But what about the good things we are doing? Is there ever a time we should quit doing those? 1. When there is something better you can do. "Good, better, best. Never let it rest. Until your good is better and your better is best." Buying your children an audio drama is good, giving them a book is better, but reading them a book is probably best. Feeding your children a meal of almost any sort is a good thing to do, feeding them a home-cooked meal is better, but feeding them a healthy home-cooked meal is the best. Reading in general is usually a good thing to do. Maybe you are reading the latest and greatest Christian book-of-the-year. That's an even better thing. But have you read your Bible yet today? That would be best. Quit the good things you are doing in order to give attention to something better. 2. When it is a job that never ends. I believe in housework. I do it regularly. But it really never ends. So there comes a time every day when I have to say, "My work is not yet finished--but I am." Even when you are doing the best of all jobs, you must sometimes quit in order to take care of your other responsibilities. My husband and I have a dear friend who bungled his wedding night because he was downstairs in the hotel lobby witnessing to the guy at the front desk instead of romancing his new bride. They can laugh about it now, but at the time, it wasn't funny. As he said later, soul-winning and evangelism will never end, but there comes a point when another responsibility should kick in. 3. When someone else should be doing it. When person A is reluctantly and with great frustration attempting to do a job that person B could whiz through with delight and joy, person A might be robbing person B. Are you ever persisting in a job that isn't really yours to do? God has equipped us all differently. Maybe you are a wonderful cook but a terrible nursery worker. You should probably bypass the playland of diapers, diggers, and dolls, and go directly to the church kitchen. Likely, there is someone else serving in the kitchen who views it as pure drudgery and is eyeing the nursery door with longing. Don't rob her. Occasionally we are called upon to serve self-sacrificially at things we don't enjoy, but normally we should be magnifying the gifts and skills God has already given us. 4. When the Holy Spirit tells you to stop. I remember distinctly one morning when I was cleaning my upstairs and the Holy Spirit suggested quietly that I should stop what I was currently doing and go clean my living room. How glad I was that I listened to that still, small voice when an hour later I heard a knock on my front door. I could warmly welcome my guests into our home without panicking over the state of the living room. But there have been other times when I heard His voice and didn't obey immediately, only to regret it later. If you are walking with the Lord, He will speak to you about even the small things of life. 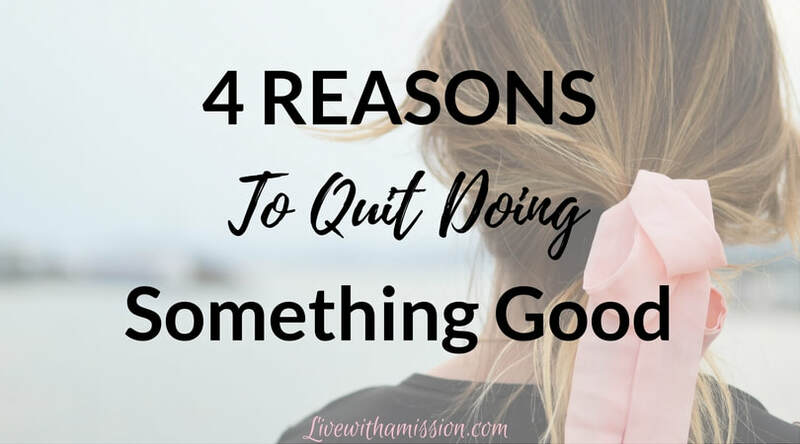 Is there anything in your life right now that you need to quit doing? 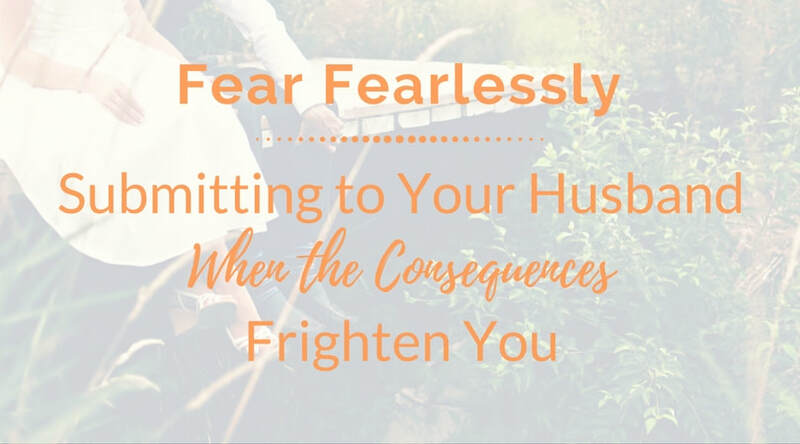 ​Does submitting to your husband ever scare you with its frightening consequences? My husband has never asked me to do anything that was sinful. But he has asked me many times to do things--or to let my children do things--that were frightening to me. Pick up our family, leave everything and everyone I love behind to move all the way across the world for Christ? Frightening. Open my mouth to speak God's precious Word to groups of women when I feel so horribly sinful and inadequate? Frightening. Get in a long metal tube and fly way too high above solid ground and way too far out over vast horizons of water several times a year? Totally frightening. There have been smaller frightening things too. Let my small children ride all the way across Manila, unbuckled. Have large groups of people over for dinner. Allow our teenagers to ride around the block on their bicycles unaccompanied. Take my children to the Grand Canyon. The list goes on and on. So many things frighten me because--like you--I relish control and those are things I have little or no control over. When my kids were smaller, one of their favorite things to do was play "mattress" with Daddy. All four little bodies would scramble onto a twin-size mattress on the hardwood floor and then he would wrench it from side to side while they tried to keep their balance. It sounds so mild when I describe it. But--really?--four little bodies on one slip-sliding mattress? There were giggles and screams and howls and owies every time, but the screaming would always dissolve into pleas of "More, Daddy, please?" And I couldn't handle it. Every time I watched it, I was sure that we would lose a child. It got so bad that they would make me leave the room (and preferably the house) before they would start their little game. Okay, so now you know the dirty truth: I'm a worrier. I can't help it. My mind is flagrantly creative, imagining horrific results to a hundred different ifs in any given situation. And it doesn't like to keep to paths of light and sanity and reality. No, it likes to venture into dismal valleys of fear and meander around, gaping at the fearsome scenery. Which is exactly why I need I Peter 3:6. It took me years to understand why that verse was there and what it means. I understood the submission in verse 1, the respect in verse 2, the whole concept of adorning in verses 3 and 4, and the hop back to submission in verse 5. (I may not adequately live it, but I understand it and do my best.) But then in verse 6, out of nowhere, we bump into a whole new topic that is seemingly unrelated: fear. Which left me scratching my head in puzzlement for a long time, until one day I realized that "not be afraid with any amazement" could also be translated as "do not fear anything that is frightening." How many times was submission challenging to me, not because I didn't love my husband and respect him, but simply because I was afraid of the possible result of submission? You know those moments when God opens your eyes and gives you a whole new perspective on life and (more particularly) your sin? That was one of those moments. Submitting to my husband when I was on board with his agenda was easy. The test of my submission was whether I would willingly submit when I feared something that was truly frightening. And that was when I finally understood why Sarah was the posterchild of submission. Her husband asked her to do some really wild and wooly stuff. Abraham may have been a patriarch, but he was also a man and thus a sinner. Try to imagine. . . Many things happened to Sarah that could have frightened her. But there was one other little gem of a verse that impacted me. While I tend to fret about the future, the godly woman of Proverbs 31 laughs at it (verse 25). The only fear in her heart is the fear of the Lord (Proverbs 31:30). Apparently, the fear of the Lord has the power to knock away all other fears. When we as wives truly fear the Lord, we can live fearlessly, even when it comes to submission to our own husbands. My goal, since I have come to understand these verses, has been to fear God and reverence my husband without fear of the results. In other words, "Fear fearlessly." I fail often, but I live with that mission. Does the thought of submitting to God or your husband scare you? Will you join me in trying to fear fearlessly?